The last time we went to walk Beinn Chuirn, (in the winter a couple of years ago) we encountered difficult conditions ….well, for me they were anyway! There was virtually no snow, but it had been very cold for quite a long period and so there was a lot of ice ….thick and black amongst the grass and rocks. I was really struggling to see it and this made for very slow progress. After several hours we were only a little over half way up and with the prospect of having to descend on this slippery ground, we decided to cut our losses and retreat. It was disappointing but wise ….and we had checked out a very good route up the hill ….perfect for a return trip in more favourable conditions. On Thursday last week, with a reasonable forecast, (well at least not torrential rain all day) we finally got to go back to Beinn Chuirn and complete our previously curtailed route. 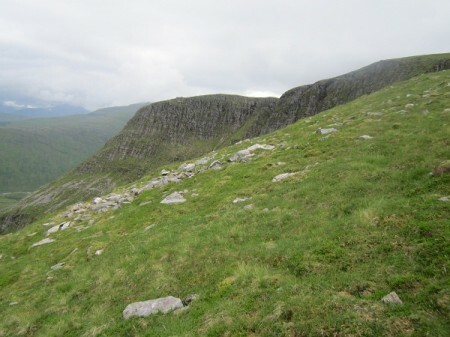 Beinn Chuirn lies on the north side of Cononish Glen, opposite Beinn Dubhchraig and Ben Oss ….and next door to its much larger neighbour Ben Lui. It took us about an hour and a quarter to walk along the estate tracks to a point just short of the hill. 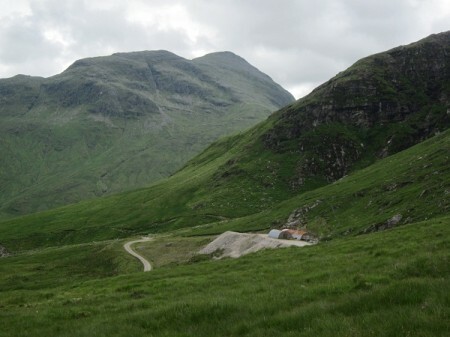 A large track leads uphill from Cononish Farm to the entrance of a now disused gold mine. The tunnel entrance leading under the mountain is sealed but a set of tracks leads out and there are still sheds there …presumably when the price of gold rises they’ll start working again. Anyway, our route led up into the dramatic and rocky little corrie and then steeply up by way of a grass and rock ridge until the broad easy angled upper slopes were reached. 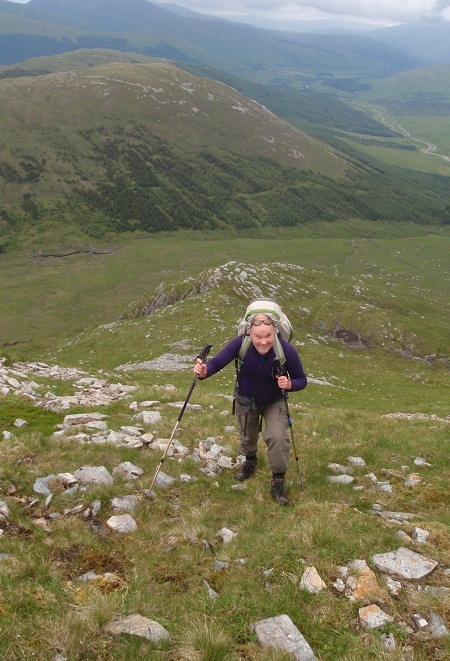 It makes for an exhilarating walk, the ground dropping away steeply on both sides and behind you and as we reached the steepest section near the top I felt glad we had turned back the previous winter! We were lucky this time though, as despite the dark heavy clouds, the rain kept away and we had good views in what was very clear air. The top of the hill is littered with boulders and strangely layered outcrops of rock ….very beautiful natural sculptures. Beyond these was the summit cairn ….the perfect lunch spot with views of mountains in every direction. As we ate our lunch though, the cloud started to descend onto Ben Lui and it became pretty obvious that we were in for a soaking. Our route back did a wide circuit down easy angled grass slopes before a final steep section led back to the track in the glen. Some way below the summit though, Nita spotted that we were not alone on the hill. Above us standing on the sky line was a large stag …watching us carefully. Despite the rain the views were still dramatic in the dark and gloomy light. We were back in Tyndrum in time for a pizza at the Green Welly and back home in Irvine at the reasonably respectable time of nine o’clock. Another great day in the Scottish Highlands and maybe even one that I’ll get a painting or two out of?